Tariffs haven’t been affecting the U.S. stock market as much as they were earlier in the year since the S&P 500 is near its all-time high. Just because the market is ignoring the risk, doesn’t mean it is gone. It’s arguably more important to focus on risk when the market is ignoring it than when the market is selling off on the news. There is still reason to worry because negotiations have failed in the recent past and Trump can easily ratchet up his demands and his tariff threats. One key point to understand when reviewing these tariffs is the headlines which state an amount of goods being taxed isn’t the total tariff. You need to multiply the goods by the tax rate. The higher the tax rate, the more likely trade will be curtailed. 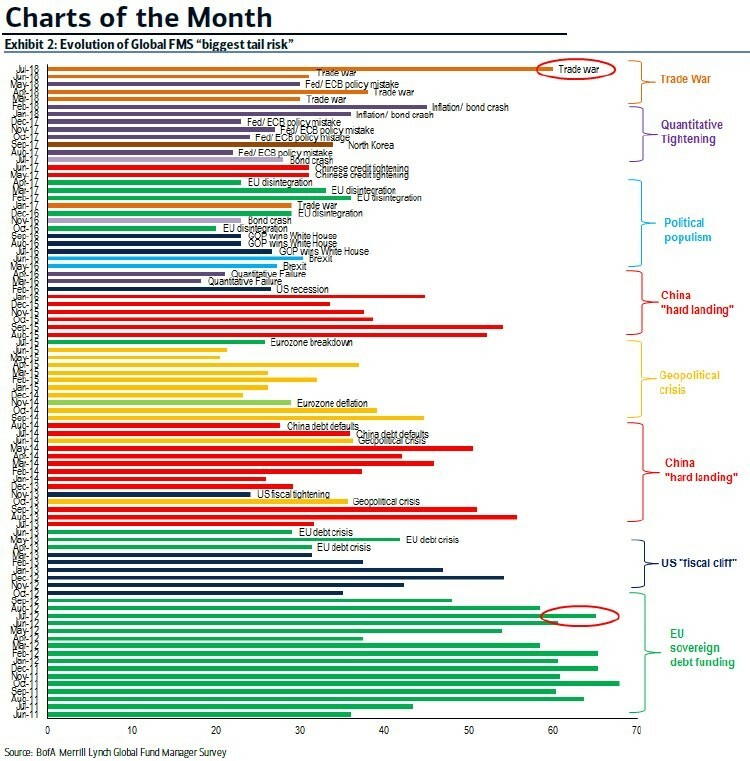 The chart below is remarkable because it demonstrates the top tail risk that fund managers fear. Many of the risks haven’t resulted in disaster since there hasn’t been a recession nor a bear market since 2011, which is how far back the chart goes. That being said, you can’t fall into the trap of thinking managers were wrong to be concerned about these risks and the wall of worry can always be climbed. Tail risks, by their statistical definitions, are low probability events which can cause big problems. 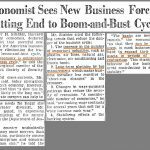 Naming the biggest tail risk isn’t a prediction that it will occur. It’s interesting to see how popular the trade war is in the recent survey as it surpassed every tail risks’ popularity since the 2012 EU sovereign debt crisis. The tariffs are in the headlines partially because Trump’s negotiating tactic is to explain to the public why America has been supposedly wronged by others. The tariffs have so far only affected a few industries, but the potential is available for a larger impact. America has a large trade deficit because it imports a lot of foreign products. As a result, the US consumer is very well off when compared to other nations. 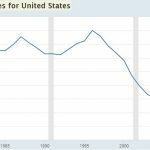 America receives capital inflow through investments in this trade situation, so it’s far from a problem for the country. If the goal is to get other nations to buy more American products, that’s difficult to accomplish because the US either can’t produce these products, countries don’t want them, or countries don’t need them. Forcing countries to buy more U.S. products that they don’t want won’t help anyone. If the goal is to lower overall trade barriers and tariffs along with supporting intellectual property rights, then the situation can be rectified. 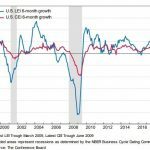 The U.S. had a $68.3 billion trade deficit in June 2018, while its GDP growth in Q2 was 4.1% and its labor market was improving. There isn’t any pain from the trade deficit thus far that is evident right now. As we mentioned, tariffs can be lowered in the final negotiations if they go well. 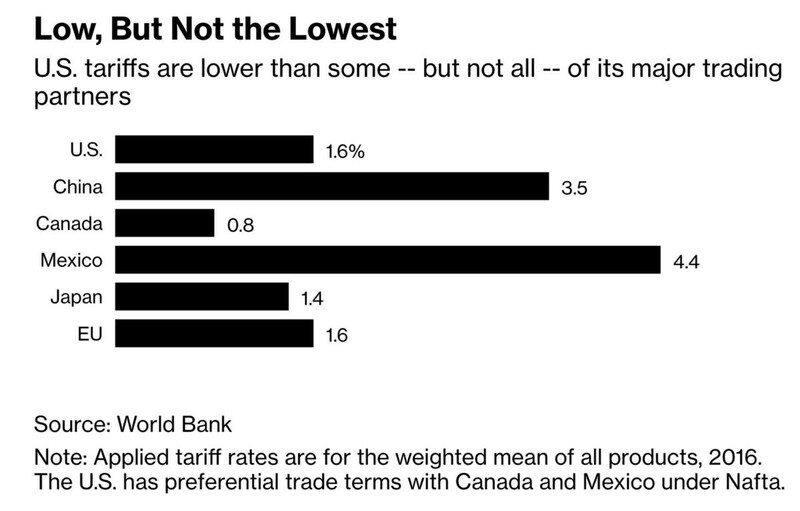 The Bloomberg chart below shows the tariff rates for the U.S.’s major trading partners. The US has the same rate as the E.U., but Mexico and China have much higher rates which can be lowered. Trump usually likes to match the tariffs other countries have on the US to use their policies against them in a sense. Something good can come of this large scale negotiation swing Trump is on if the countries with heightened tariffs lower them. It’s difficult to keep track of all the tariffs because most of them are just threats. Threats can change every day because they are only used for negotiating leverage. 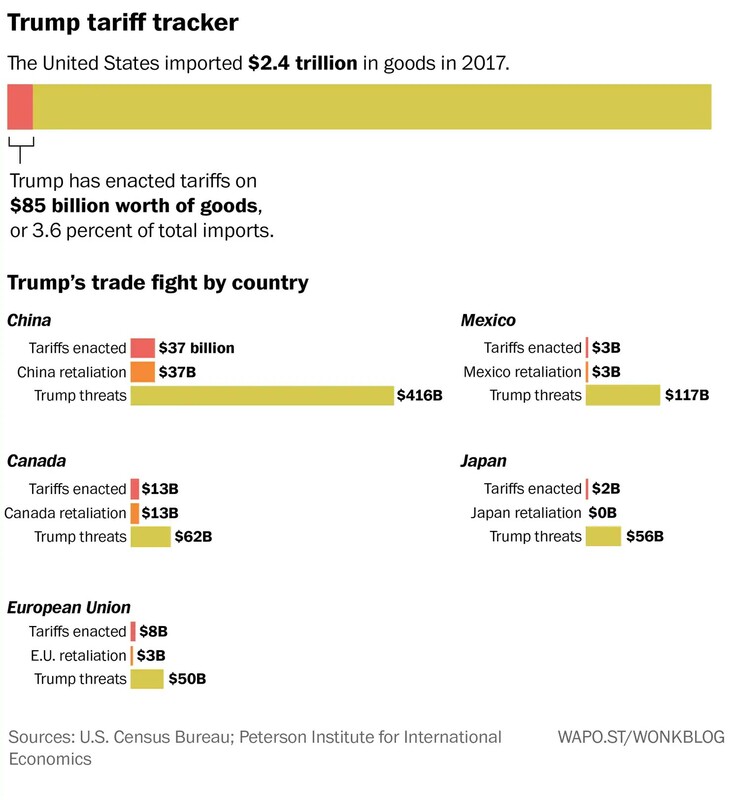 As you can see from the Washington Post chart below, the President has enacted tariffs on 3.6% of total imports. Trump’s threats on China are the largest because it is the nation the US has its largest trade deficit with and China is being accused of stealing intellectual property from US companies. There could be more of an effect on the economy than what has been felt so far if all these threats are acted upon. President Trump recently announced $12 billion in emergency aid for farmers who have been hurt by his trade actions. One example is China’s tariffs on American soybean production. Farmers, along with other industrial and manufacturing firms are also being hurt by the increase in steel prices. 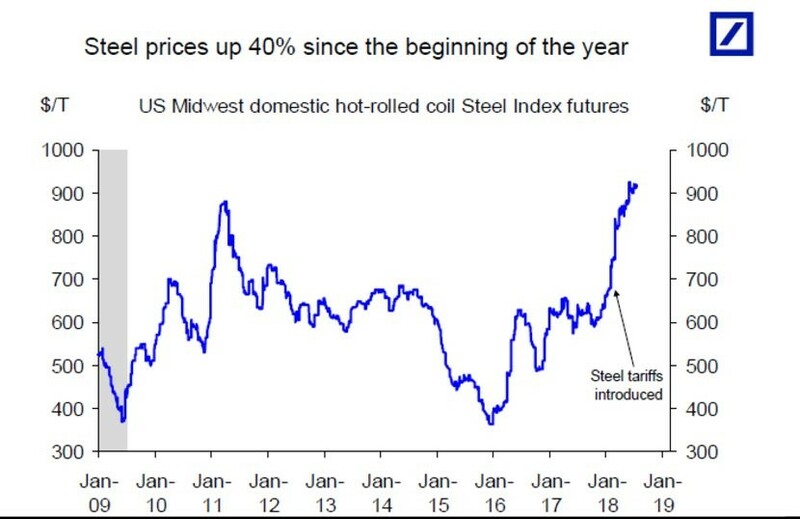 The Deutsche Bank chart below the U.S. Midwest hot-rolled steel index futures are up 40% since the beginning of the year. One of the most interesting parts of the farm bill tactically is that the GOP congress members are using it to express their displeasure with Trump’s tariffs. We are getting near the end of the line with these skirmishes because if Trump loses his party’s support, he’ll lose negotiating power in the trade deals. The latest battle in these heated trade talks is that Trump threatened to put a 25% tax on foreign autos. This could increase the price of cars between $455 to $6,875 depending on the size of the tariff and the type of car. 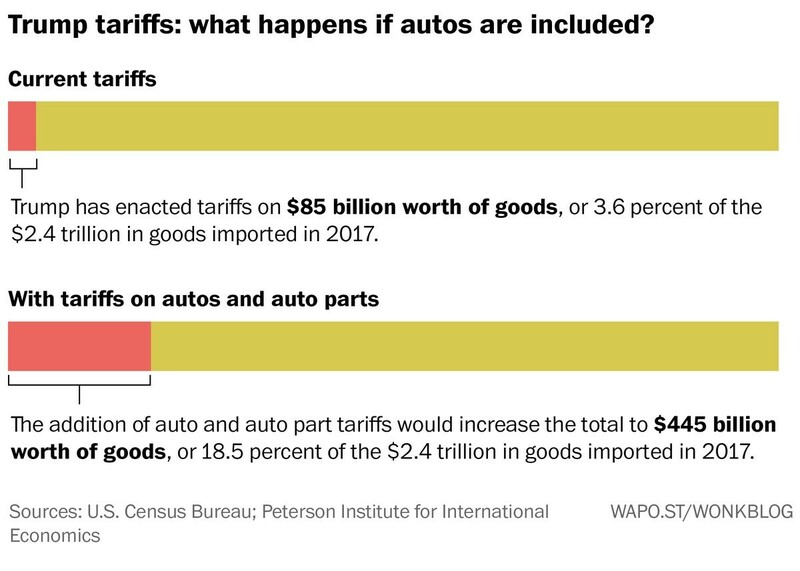 The Washington Post chart below shows the total tariffs in place would increase from $85 billion to $445 billion if these tariffs are enacted. Trump doesn’t like that America has a 2.5% tariff on European cars, while Europe has a 10% tariff on American cars. The good news is that the latest negotiations between Trump and Jean Claude Junker, who is the European Commission President, appear to be going well. Just because the leaders are making amicable statements doesn’t mean the issue will be resolved, but if it does get solved, the risk of a trade war with Europe will diminish greatly and the strong U.S. economy will have fewer hurdles to climb. 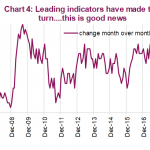 Either the US economy and corporate earnings are making the heated trade rhetoric irrelevant or the market feels the risk has been lowered. However, the risk is still in play. It makes more sense to be worried now than when the market was reacting to every trade war headline when it declined after tariff announcements. That being said, we aren’t advising you to avoid risk assets because of this. All sides of these trade skirmishes have the economic incentive to agree to a deal amicably. Europe and America appear to be in good shape in their latest talks.